Access land in the Peak District re-opened this week, but moorland fires raged in the South Pennines. The situation in the Peak is under constant review after Countryside and Rights of Way (CRoW) access areas were re-opened after weekend rain. Sean Prendergast, in charge of access and recreation for the park authority, says walkers still need to exercise caution when out on the hills. Last week, firefighters and estate and park authority workers fought a blaze on Bleaklow which burned for 48 hours. 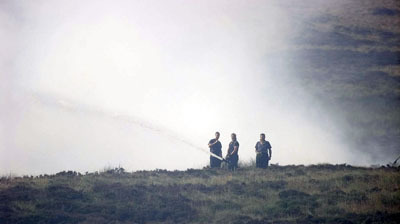 A helicopter scooped water from Woodhead Reservoir, dropping it on the smouldering peat. A large fire is still burning, four days after starting on the Lancashire-Yorkshire boundary between Colne and Oakworth. Ilkley Moor in West Yorkshire is also ablaze. And a large part of the western end of the North York Moors access land was closed, only days after being re-opened. Ranger-led walks in the Peak District resumed this week after being suspended during the closures. Walkers should check out the National Parks' websites before setting out this weekend into the access areas. All the authorities are stressing that the closures only affect CRoW open access land and that all public rights of way, footpaths and bridleways, are open as normal.